The start of this year was a landmark for HRH, with all 2016 events being sold out before the year started. With this in mind, HRH have decided to stage one last event this year in December dedicated to a unique genre that's played a part in everyone's Rock n Roll life. Sometimes everyone can be guilty of forgetting our roots as well as bands and their music that have played their part and in some form or another impacted in our lives as we've grown grow up. We want to dedicate this HRH Xmas Rocka to a genre of music that lay the foundations for a lot of us whilst we emerged into our own circles of music. Most people touch on it..or probe at it, we want to dedicate a whole weekend to it. We want the HRH Horn to sound the "Roll Call", and gather the bands and tribes we all created, under this unique genre banner, we all came to love, N.W.O.B.H.M. Some of the bands don't play much, some have retired in some ways or went on a hiatus crusade, but the horn has sounded and were calling in 25 of the best and putting them all together into the 02 Academy in Sheffield on the 2nd and 3rd of December in a 2 arena, 2 day HRH Xmas Rocka, aptly named HRH NWOBHM. 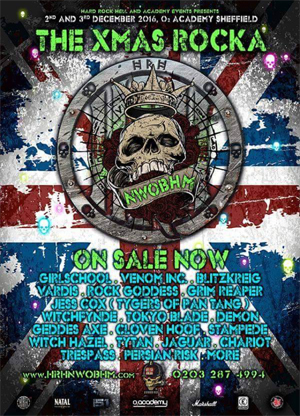 HRH NWOBHM will probably be a one off, however it will feature three exclusive HRH Hotels on the venues doorstep, with the usual Classic, VIP and Royalty packages. It will probably be a one off. There will be two stages both days, Friday will start 17.00, Saturday 14.00, both days til late. Hotels offer Classic, VIP and Royalty Passes as well as the usual privileges. Even Santa’s going to the HRH Xmas Rocka, so you better watch out as they say…. Get locked for Xmas HERE.